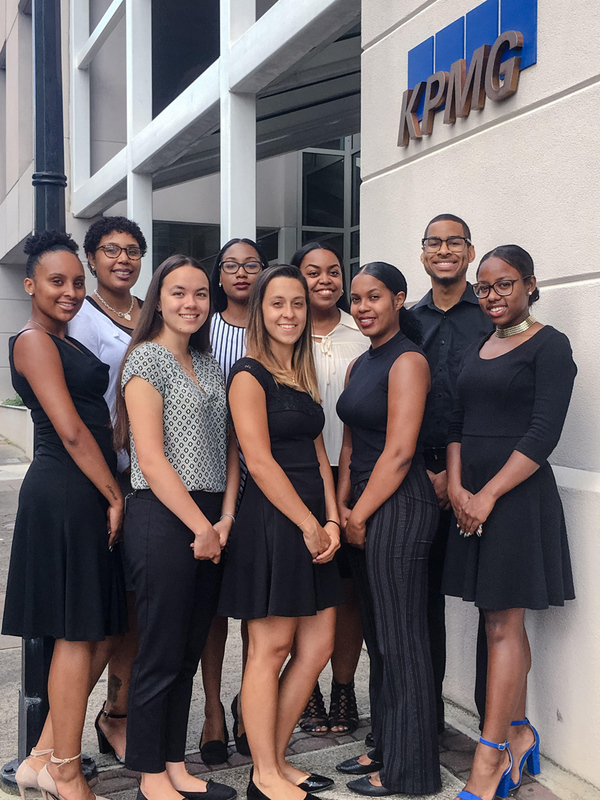 The eleven students participating in the internship programme are Brianna Buchanan [University of Alabama], Chelsea Warren [Oakwood University], Ciara Rego [University of Tampa], Asia Smith [Middlesex University], Clevon Cunningham [St. John’s University] Anna Harrington [University of Western Ontario], Nikari Furbert [Johnson & Wales University], Justice Edness [Acadia University], Justine Dzofonoo-Burch [New England Institute of Technology], Simone Wales [Alabama A&M University] and Daniel Nash [University of Southampton]. Wanda Armstrong, Senior Manager in the firm’s HR department said: “KPMG in Bermuda seeks to identify talented, career- oriented Bermudian university students capable of maintaining high standards of integrity, service and academics who are interested in a career in accounting, finance or business. The students started their internship on June 6, 2016 with their first week consisting of Audit training and they are in the process of participating in a two week project for seven local non-profit organisations. Establish an electronic client database; inventory of residential supplies and recording systems. The projects will provide the students the opportunity to use their initiative and creativity, with a mentor system in place, and allow them to improve on their presentation skills as they deliver their findings and recommendations to KPMG’s management and staff and the Senior Executives from the various charities. As a separate project, the KPMG Interns will participate in the Centre of Philanthropy’s Summer Intern Community Day that will be held on July 15, 2016. During the internship, KPMG will host three professional development workshops focused on developing other business skills. The students engage in sessions covering “Dressing for Success”; “Communication, Listening and Interview Skills”; and “Dining and Workplace Etiquette” which consist of a three course dining etiquette lunch at a local restaurant. The interns will also be responsible for the planning and organising the KPMG’s annual summer K-Nect networking event to be held at RUMBAR on July 20, 2016. K-Nect provides any Bermudian student interested in studying accounting, finance or other business-related subjects an opportunity to meet and socialise with KPMG staff and find out more about what a career with KPMG can offer. For further information on the KPMG Internship Programme, visit kpmg.bm and click “Careers” or contact Wanda Armstrong at wandaarmstrong@kpmg.bm. Good luck. You kids just climbed aboard the Titanic – just wait and see. Congrats young ones. Take advantage of this opportunity and don’t forget to give back later on.